Pamela comes back today. I will be picking her up from the airport at approximately 1:25. I'm pleased to say that I managed to get all the jobs I had planned to do done. The garden walls are all snowy white again, the pool is clean for the Winter, the garden is tidy, the furniture on the roof is all sanded and re-oiled, the washing is done and the house is clean and tidy. It won't take Pam long though to find something that I haven't done. Last time she was in England I spent two days dusting and polishing everywhere. Within ten minutes of her return she found the one shelf that I had missed! My excuse was I had to leave her something to do. In any case I was doing all my own jobs and her jobs as well. 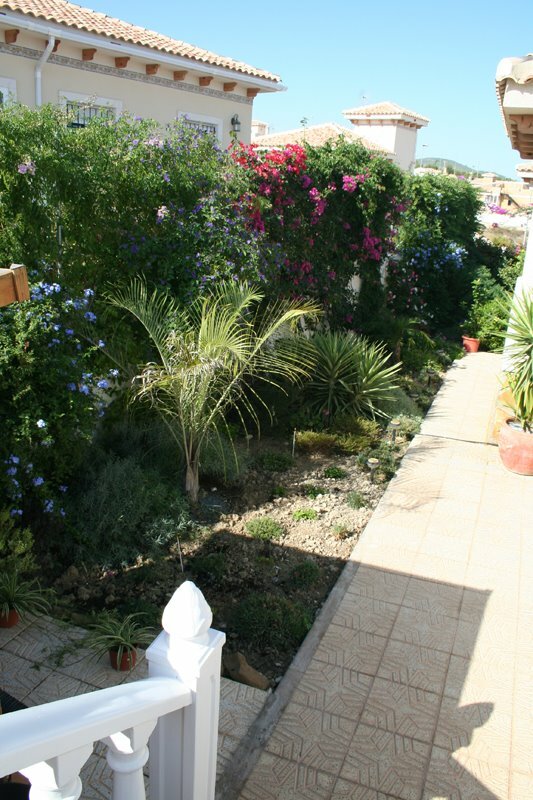 If I went to England would I come back to find the pool cleaned or the bougainvillea tied back to the fence? It looks like Bigastro was already anticipating problems with water supplies back in July and posted these notices on their web site. Of course building more and more flats and houses doesn't help! Yesterday I got the opportunity to complete the re-installation of Windows on my laptop. My Dell Latitude is five years old and has never been reformatted. So Windows was crawling, startup was so slow you could have made and drunk several cups of coffee before the thing was ready for work. It was time for a complete clean out. Re-installing Windows itself was a pain. It took me three installs to get it working properly . The video driver seemed to be the main root of the problem. Finally I was able to get a new driver from the Dell site which sorted that out. For the satellite connection to work with sites like Microsoft Update you have to set the MTU value of your network card to 1135 (the default is 1500). Fortunately a program called Dr TCP allowed me to do that. So yesterday I was ready to update Windows. It took all day to download and install all the 80 plus updates for Windows but I finally got there. My reward is a fully restored laptop which starts up like a tiger. But still you were in my mind... And now I am sending my letter to you. a) my children call me Wilf, friends at my old school called me Willo, my Spanish teacher calls me Quique and my real name is Keith. Nobody has ever called me Daniel. b) my wife comes home on Tuesday and she is enough for me to cope with! c) a smiling face etc. sounds nice but what I am really looking for is a quiet life. So please excuse my temerity; I've put your message on my blog in case someone reads it who is called Daniel and wants to take advantage of your generous offer. PS Be warned she might just have an infection or two to pass on to you so visit her at your own peril. I wondered why I had so many vists from the same person in Spain to my blog until I realised that my blog counter was now counting my own visits. The fact that this person was using the same browser, operating system and screen resolution as me was a strong clue. The fact that he was using the Blogger dashboard as a referring link was an even better clue! The change of satellite provider has meant we now have a new IP address. The counter was of course blocking the old IP address. I've sorted that now so that my visits are not counted. Update: Well I thought I'd sorted it but then our IP address changed. It looks like the Wi-Surf router is using a dynamic IP address to connect our network to the Internet. I just can't keep up with this!! There are quite a few new pictures in Our Spanish Album. Click on this link or the one in the sidebar to view the album. Click on the thumbnails in the album to get a larger picture. Some consumers are reporting that they are experiencing cuts in their water supply already. 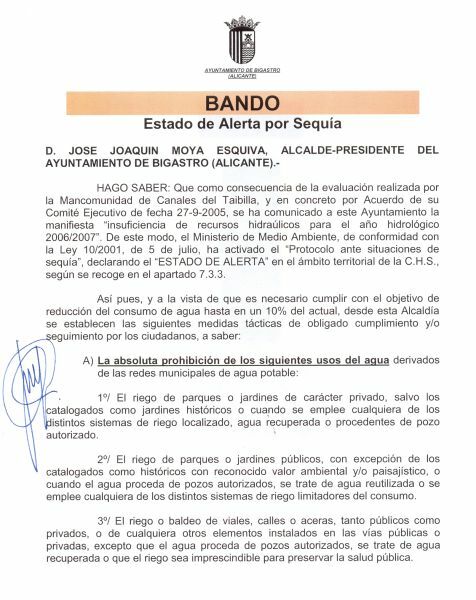 However, the main administrative move has been the decision of the water management body, La Mancomunidad de los Canales de Taibilla, to warn town halls that cuts could be necessary and that they should make arrangements soon to be able to introduce them. 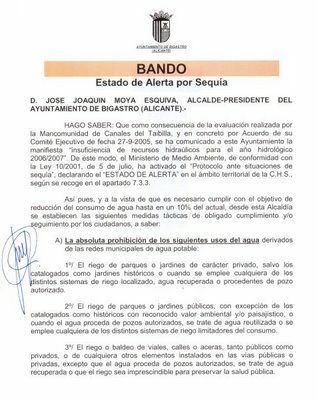 The Mancomunidad is responsible for supplies for some 2.5 million people in Murcia and Alicante and it has now introduced a drought order in view of the situation in the rivers Segura, Júcar and Tajo. All the town halls of Murcia region, about half of those in the Alicante area and two in Albacete, have been warned that interruptions in supply may be needed. 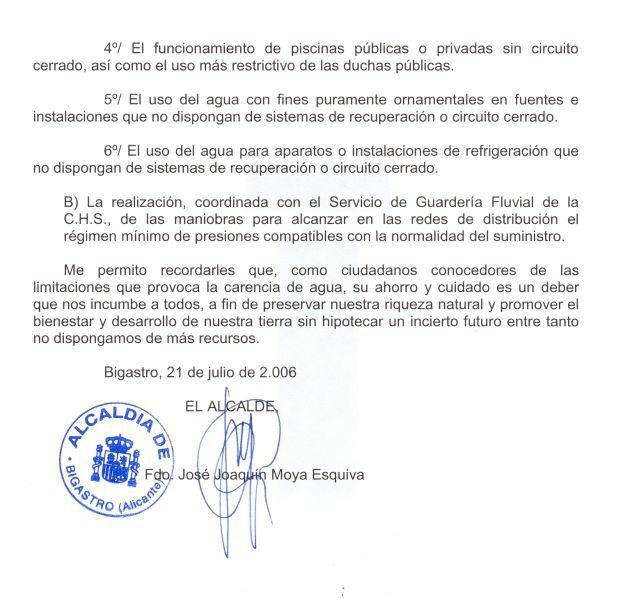 However, the Spanish cabinet is meeting today to decide whether to approve an emergency transfer of water. Recent rains in Spain, although not in the south east, have led to a small increase in water stocks and the environment minister, Cristina Narbona, says she recognises the seriousness of the situation facing Murcia and Alicante. That is why the emergency move has been proposed. The government currently sees desalination plants as the solution to the water supply problems of Murcia, Alicante and other coastal areas. A second unit at the desalination plant at San Pedro del Pinatar is being brought on stream this week and will soon be pumping water into the distribution pipes. This unit and the existing unit will each provide 24 hectómetres of pure water each year, which is enough to supply just under half a million people. The argument that desalination will be the solution hasn't impressed local consumers and politicians at all. Desalination requires large amounts of energy for the plants to work and currently that means energy from oil. There is talk of renewable resources, such as wind power and solar energy, contributing but for the foreseeable future the main fuel is going to be oil-fired electricity. As the price of oil goes up so will the price of desalinated water, critics say. It has even been claimed that the cost of the energy to replace current supplies from transfers with desalinated water would equal the entire existing energy bill of the region of Murcia each year. Environmentalists don't like desalination either, saying that the brine discharged into the sea after treatment harms marine life. Following the story about the mouse looking at the moon, our teacher brought us a script for a children's play about an owl, the sun and the moon. For some reason there is a cricket playing a violin, a wolf howling, a courting couple and a poet writing poems in the play as well. The moon hatches a plan to take over the job of the sun in the daytime as well as at night. The owl doesn't think it is a good idea but the moon confronts the sun with the plan and the sun agrees. This is OK for the courting couple, the poet and the nocturnal animals but the children are cold and the plants are not growing. In protest the cricket decides not to play his violin. Even the courting couple decide that enough is enough. So it is down to the owl to convince the moon that the plan is not working. By this time though the sun is fast asleep and needs a bit of a shake to get him going. It does all work out in the end though and the sun returns to light the sky in the daytime. The moral of the story is "cada cual debe estar orgulloso de ser como es y no ansiar lo de los demas". Everyone should be proud of what they are and not long to be someone else. Fascinating stuff! I just wonder how long it will be before we can progress to adult stories though. Rachel and David are setting off back for England today so last night we went out for a typical Spanish tapas meal in Bigastro. Casa Eloína is not the easiest of places to eat tapas at because there is no menu and no display of tapas on the bar itself. You just have to ask for what you'd like and hope that they can make it. In fact because we have been in there a few times the girl seems to know what we want anyway. So plenty of food washed down with a bottle of the house red followed by coffees cost us 28€ for the three of us. Not bad for an evening out! For those of you who thought that the bull always comes off worse just check this video. Our new theatre/concert hall is now open for business and will be inaugurated this Friday. 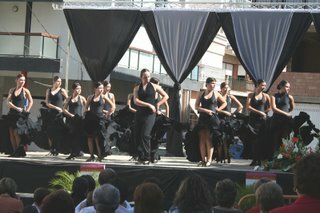 It is named after Francisco Grau Vegara who has been the Director of the Banda de Musica de la Guardia Real since 1998. Francisco Grau was born in Bigastro and started playing music at the age of 7 in the local band. 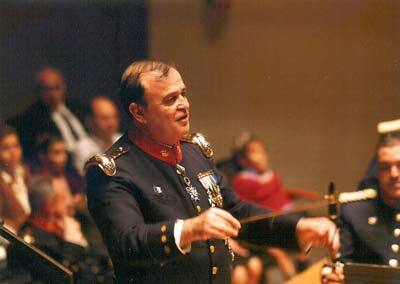 He has written over 700 pieces of music including the National Hymm of Spain and is the holder of many military and civil honours. The building is a fine tribute to this famous Bigastrense. The good news is that the internet connection is stable so far. The bad news is that the speed of the connection is a lot less than that which we had before. I've tested it using the same sites that I used with the previous connection and tried it several times at different times of the day. On the basis of that, the telephone certainly would not work. Ah well we will have to wait and see. For the same monthly fee I could potentially have a 4Mb connection using ADSL. Sorry Mr Wi-Surf but we originally signed up for 2Mbs not something approaching 512Kbs. Of course there is still the issue of distance from the exchange as illustrated in this graph. There is not much point switching to ADSL using the phone line if we are too far from the exchange. Last year’s Autumn Fair was very good. 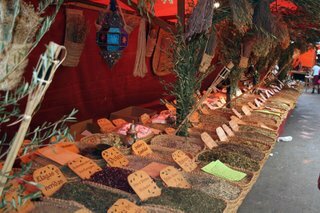 This year it was even better with more stalls, more entertainment and more people. 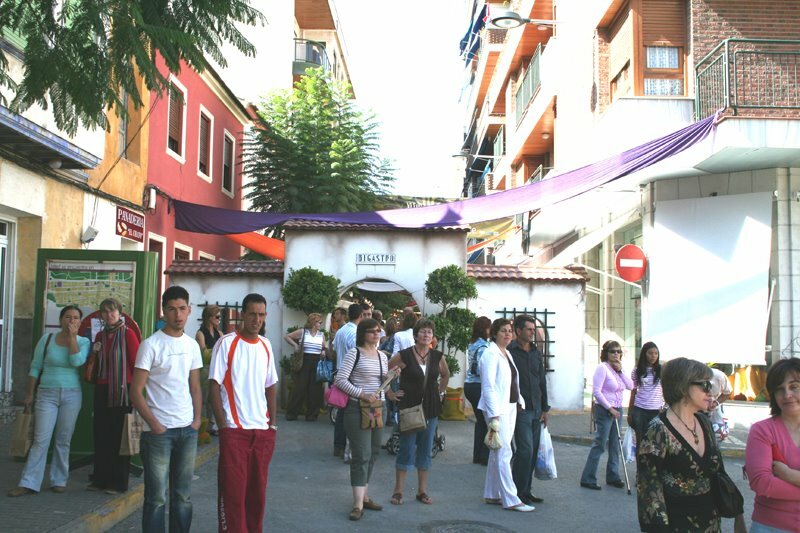 Apart from the fair itself, a lot of the shops were open – on a Sunday! 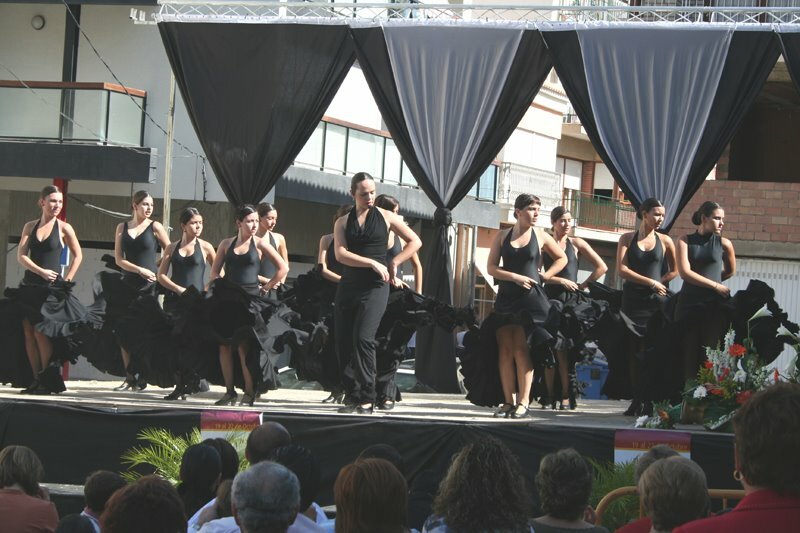 The Ayuntamiento (Town Hall) had set up a stage at the entrance to Calle Purisma especially for the fair where they put on street entertainment including this flamenco dancing class. The entrance archway to the fair was built on Friday and will be knocked down on Monday. As you can see there was a wide variety of goods on sale including food stuff, clothing, cooking pots and jewellery. The herbs in the bags are cures for every conceivable ailment. Both nights the Ayuntamiento put on concerts in the new theatre including a special tribute to Mozart by a Valencian orchestra. All the entertainment was of course free. The local free paper told us that the 12th October was the day that Torrevieja celebrated links with Spanish speaking American countries. 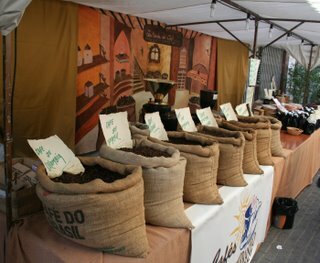 This year the event was to take place at the Eras de Sal and would include dancing and singing along with food drink and crafts from South American countries. 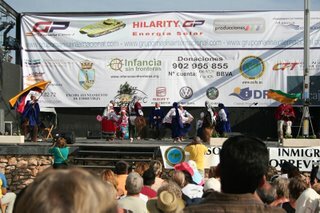 So we went down to Torrevieja only to find that it was in fact the 14th when the event would take place. So we went back to the Eras de Sal on Saturday. There were a few stalls selling crafts, food and drink but not many. The setup inside though was something else. 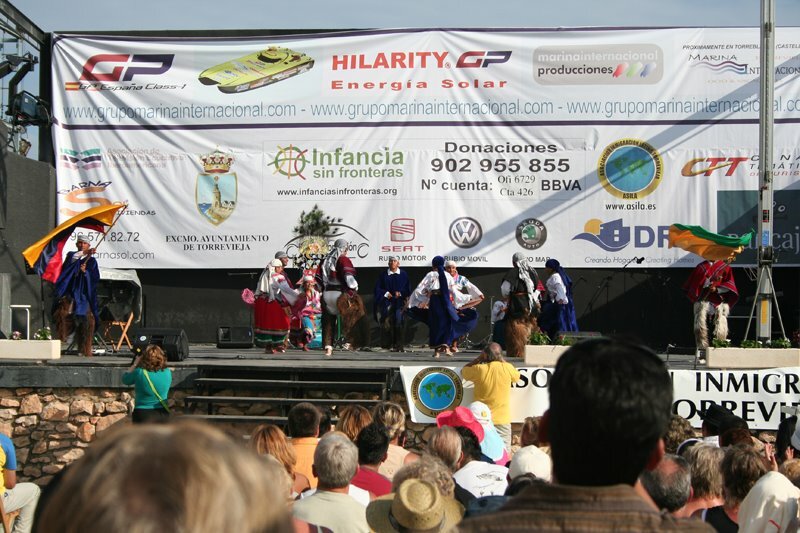 The event was being televised for broadcast in the Hispanamerican countries so the back wall, as you can see, showed the profusion of sponsors. 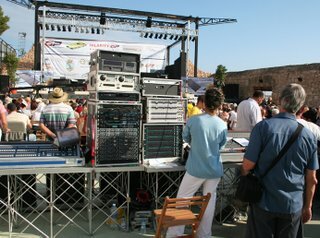 There was also some very serious sound and lighting equipment. We stayed until about 7:30pm when the place was becoming crowded. Spaniards, fresh from their siesta were arriving in their hordes all dressed up in their best clothes ready for a night of partying. The acts taking part came from the full range of Spanish speaking countries including Peru, Mexico, Argentina, Columbia and Peru. The dancing in particular was quite spectacular and well worth seeing. One slightly confusing item on the programme was Joe Black’s Brass Band from England. Maybe they meet to rehearse at a Mexican restaurant! I don’t understand it. When Pamela is here I sleep well most nights. I maybe get up once to have a drink or go to the toilet but that is it. When she is not here I can wake up two, three or more times. Sometimes I can get back to sleep almost straight away but other times I lie awake for what seems like ages. In the morning the bed is an absolute mess. Even the mattress has moved over to my side and I feel like a wreck until mid morning. I’ve tried going to bed a bit later, I’ve tried having an extra brandy but neither has any effect. Maybe it’s because I am missing Pamela and worrying about how she is but she would never believe that! 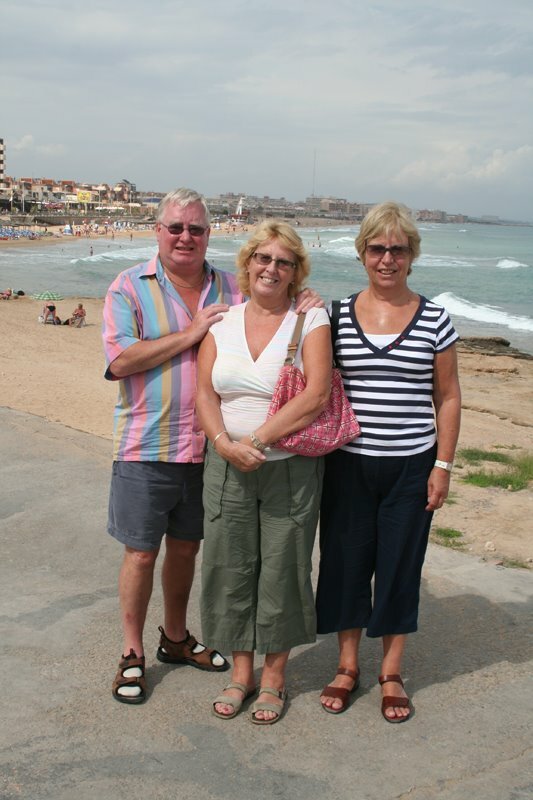 When we came over in November ’04 to complete on our house we stayed in a hotel in Guadamar and met Rachel and David. Just by coincidence they were completing on their house at Villas Andrea as well. So with such a good point of contact we made friends. Rachel and David are not residents but do come out for several weeks at a time. Normally Rachel will email me to let me know that they are coming but with the Internet down that hasn’t been possible. Anyway we met up with them at the market and they came round to sample my paella the following Saturday. We had a great time catching up on news and events. We ate outside in the warmth and chatted until it went dark. I knew then that we should either come inside or I should spray myself with repellent. Although Pamela had brought out the citronella candles to keep the mossies away, I still have a dozen bites on my arms and ankles which prove they don’t work. The mossies, like Rachel and David, haven’t been about for awhile but they are obviously back now. I was bitten the week before so I should have known better but there you go. PS none of the others were bitten. I can’t tell you how happy that makes me feel! 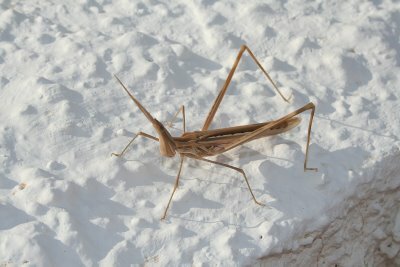 We get a lot of weird insects in the garden. Some of these pests eat the leaves on the palm trees and the hibiscus and are therefore most unwelcome. Others seem to be less harmful. This little fellow was new to me though. I was painting the top of the wall and noticed him sitting on the new paint. He was struggling to move which wasn’t surprising given that the paint had hardly dried. Does anybody know what he is? Of course we love our location on the hill up to the Pedrera. It gives us good views; the plot is big enough for a pool and a garden and it very quiet up here. 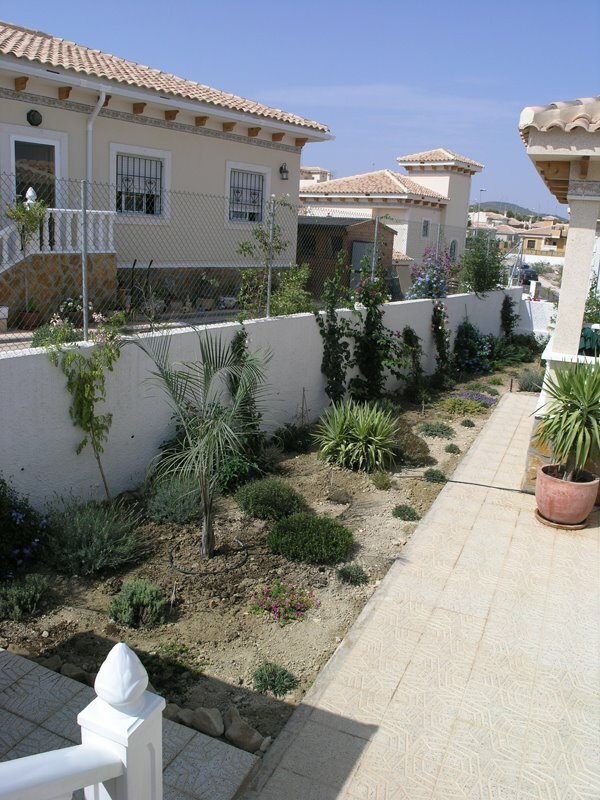 A lot of Spanish people though seem to prefer living in apartments and houses in the towns. You can see why when you go down in the evenings to Bigastro. During the daytime Bigastro is very quiet except Mondays and market days. From 2 o clock until 5 during siesta it is deserted but then each night at about 7 it becomes a thriving community of folk. The children play out in the park, the teenagers meet each other in the streets, the parents go out for walks and the grandparents sit outside their houses watching the world go by. The shops are open and the bars are busy. By nine o clock Bigastro becomes quiet again as the people return to their apartments and houses to eat. 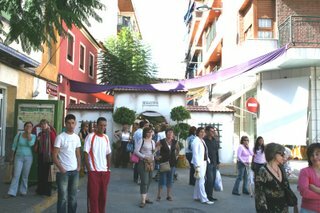 The Spanish, like the French and the Italians, love to paseo. Our Spanish teacher can’t understand why we Brits up the hill don’t. She can’t understand why we disappear into our houses during the evenings. Of course our eating habits are different. Spaniards tend to have their main meal at lunchtime whilst we have ours at night. So when they are out socialising we are tucking into our main meal for the day. Mainly though we are not used to going for walks at night. For most of the year in England it is too damn cold to go out in a T-shirt and shorts. I mean who wants to go out for a walk in the cold and the rain? Maybe in time we will adapt and the park at the bottom of our estate will become a meeting place where we will sit and chat. Somehow I doubt it. In our Spanish class we read passages from a book intended for young children. The first story was about a mouse looking out of his bedroom window at the moon and the stars. The second was about King Midas and the “midas touch”. It was embarrassing that I couldn’t even pronounce some of the words let alone understand what they meant. We then went on to extend the story about the mouse and say what he did next. Pamela had the advantage there because of her primary teaching background. She explained (in very good Spanish) that the mouse thought there was a man in the moon (el hombre de la luna). She told us that the mouse thought the man was eating the moon because it was made of cheese (la luna está hacer de queso) which made the moon smaller (mas pequeña).Very impressive stuff I can tell you. My best effort was that the mouse closed the curtains and went to sleep. Anyone who has tried Michel Thomas’ CDs to learn Spanish would be led to believe that you only need to understand about 600 words to read most newspapers. I can assure you Mr Thomas, you’d need a more extensive vocabulary to read that children’s book. Well I am nearly there with my Spanish driving license. I had a letter from Traffico telling me to go to Alicante to trade in my English license for a Spanish one. What I actually got though, after a three hour wait, was a temporary license. Apparently my plastic card license will come in the post within two months. In the meantime I can use the temporary one in Spain as long as I carry valid ID with me. So nearly there but not quite. Just as well that Pam didn’t get her letter because she could not have used a temporary license in the UK when she visits there next week. Her letter will hopefully come whilst she is in the UK. We can then go back to Alicante for another three hour wait! Still we had a good day out, did a bit of shopping in El Corte Ingles and had a nice lunch in Alicante at a “buffet libre”. The Sony 20 inch Wega screen that we bought looks good, has a surprisingly good sound system and is fine for normal broadcasts. It is hard work watching widescreen films on it though. All you get is a narrow strip of picture across the middle with a black band at the top and bottom. On reflection we should have spent the extra money to buy a 26 inch widescreen set but at the time they were so expensive. Prices of LCD screens have dropped a lot. The ubiquitous 17inch LCDs have all but disappeared and you can now get sets up to 60 inches. So we bought a Sony 32 inch Bravia V series set and have confined the 20 inch set to the bedroom. When I first set the new television up in the lounge it looked so big. It seemed to dominate the room and made the hi-fi speakers look so small. Now we are used to it and it fits in well. Movies are a joy to watch; we can even read the subtitles at the end. At our Spanish class the other week we did a bit of work and then we had a discussion (in Spanish of course) about the differences between living in Spain and England. Inevitably the conversation came around to the girls who offer their services on the roundabouts and alongside the main roads. Actually I have to confess it was my fault because I raised the topic. We explained that this practice would not be allowed in England. Whilst the Guardia Civil happily ignore what is going on, the police in England would arrest any girl attempting to solicit so openly on the roadside. It isn’t just at night that you see these girls, there is a day shift as well. In fact the day shift is growing in number. Once you might have seen two girls on the way to Torrevieja, now you spot half a dozen. They each have their own patch, presumably with regular customers. Some are well set up with a brolly to shade them and a chair to sit on whilst others just stand in the baking sun. Most are dressed in jeans or shorts but we have seen some in tiny little skirts that do nothing to hide their naked bums. A lot of the girls on the night shift wear just white underwear so you can easily spot them in your headlights. I suppose some of the girls feel that you need to see the goods before you decide to buy. Prompted by our teacher, we concluded that some men take time out of work to avail themselves of the services on offer whilst others have an extra course at lunchtime. It explains why some Spanish drivers are in such a hurry. They are obviously making up for lost time. The discussion then moved on to hygiene. Our teacher suggested that maybe they had a bottle of water and possibly some soap to clean up between customers. The idea of being the last customer without such measures was not a pleasant one. We then asked what rates they charged but she said she didn’t know. We imagined it might be anything up to 50 euros but a better informed member of our class suggested the normal price was more like 30 euros. Apparently you pay more for the girls in the clubs but then you don’t have to struggle in a car with them. It is important to know about these cultural differences. I bought my new camera when we went to visit Cartagena in early June. I’ve used it a lot since then and even bought an external flash and a telephoto zoom lens to use with it. It is only now though that I am getting used to it and finding the best ways to get the photos I want. Like all digital cameras it has a fully auto mode where you just point the camera and shoot. With my Olympus I used to use that mode for most of my pictures because it was the easiest way to use that camera. With my new Canon the manual settings are much easier to achieve than they were with the Olympus so I am using them a lot more. For example you can easily select which of the five focus points are going to be used for auto focus. Choosing the right points ensures that what you want to be the main subject is rendered sharp. On the Olympus you could choose spot or average focussing with or without assistance. The process required a lot more button pressing so I tended to forget to do it. The simplest way to use the external flashgun is to set it and the camera to auto. The camera sets itself to 1/60th second shutter speed and the widest aperture of the lens. That gives the flash the longest possible range but doesn’t necessarily give the results I want. Like all lenses, mine work best at the mid range of apertures so even for normal flash it is best to set the aperture manually. For fill in flash where the flash is used to lighten part of a daylight photo setting the aperture manually is essential. Fortunately setting the camera manually is very easy to do. Set the camera to aperture priority and then once the flash is attached, the camera selects the right shutter speed to use. The flash then sorts itself out according to the chosen aperture. For fill in flash I can therefore choose the right aperture to balance the flash and daylight exposures. The biggest improvements over the Olympus though are the speed at which the camera works and the lack of digital noise in pictures taken at higher film speed ratings. Auto focus on the Olympus could be very slow on pictures with limited contrast especially in low light. The Olympus also produced pictures with distinct digital noise at 400ASA. The Canon focuses very quickly and is still useable at 1600ASA. There are a lot more features that I haven’t delved into yet. Using these features might take me longer to get my photos but it should be worth it. Hopefully when I have mastered the camera you will see the improvements in the pictures that I post. We watch programmes on the National Geographic channel and have learnt a lot from them. One of the series they run is about aircraft disasters. Now those are scary especially when the aircraft involved are the same ones we use to fly back to England in. During the programmes they examine each crash in great detail to determine exactly what caused it. In some cases it is human error but too often it is a design fault or a faulty repair to an aircraft. The other night it was the rear of the plane that had been repaired by Boeing and they had only used one row of rivets to fix the new panel instead of two. On a previous programme it was the cargo door that opened outwards instead of inwards to make loading quicker. A failure in the hydraulics seems to feature all too often. Next time I fly I might just ask the pilot “has this plane been repaired properly”, “when was it last checked”, “which way do the cargo doors open”, “are all the hydraulics routed through one part of the plane”. Never mind the stewardess telling us “in the event of landing over water” – most of our trip is over land – what happens then? I think I know the answer to that one from the programmes we have watched. I took Pam to Alicante airport last night. When we got there I went up to the upper level parking because you can waste a lot of time looking for a place at the lower level. However, you now have the same problem at the front of the upper level. Where there used to be loads of free places, these are now filled because new hire car companies are parking vehicles there and are working out of what look like ice cream vans. To make matters worse though people have taken to parking on the roadways which make it difficult for you to even get around the car park. Give me Murcia airport anytime; the parking there is much better. PS Pam has phoned to say that she arrived in the UK with just a short delay. Surprise, surprise though Manchester has grey skies and rain. We decided to go to Lo Pagan where we had promised to take John and Joyce. We’d been there before on our coach trip to the market at San Pedro del Pinatar and also when we went to watch Aire 06 but had not had a chance to explore the area fully. Just as well we didn’t take John because we walked for miles and came home shattered. First we parked at the fishing port at Lo Pagan and walked along the promenade to Santiago de la Ribera. After a refreshment stop we walked back to the car and had some lunch and then set off to the Parque Reg. San Pedro del Pinatar which is a series of salt lakes populated by flamingoes. 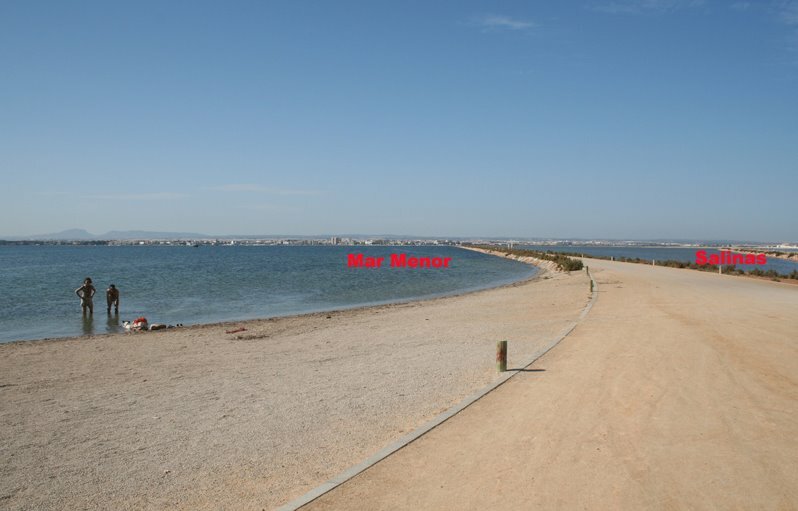 There is a very long path which we followed that goes out to sea with the park on one side and Mar Menor on the other. 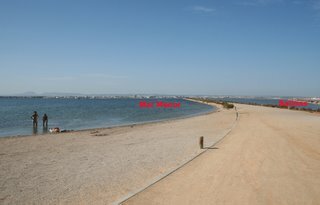 When you get to the end you are only a short distance from the strip of land which separates the Mar Menor from the Mar Mediterraneo. On this strip are the posh hotels and apartments. On the salinas side of the path we followed, crazy Spaniards (and possibly others) cake themselves in the mud from the bottom of the salt lakes and then let it dry on them. We are told that the minerals in the mud are good for the skin. Even stranger though are the people who sit in a brackish water channel bathing in stinking brine. 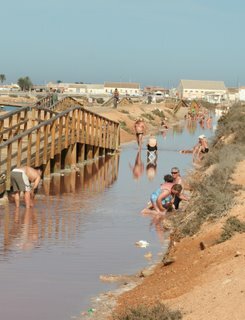 Note the lady who has even taken her chair to sit on whilst she bathes her feet in the water. Sensible people of course just lie in the sun or go for a swim on the Mar Menor side of the path. 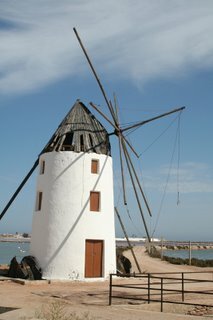 As you can see the molinos or windmills are way past there best and wouldn’t stand any tilting. Sounds like a title for a children’s story but it isn’t. The plane in question flies over our estate and I dare say a lot of other houses at what looks and sounds like 50 feet up. Some days it arrives at a respectable hour but on others it will fly over at the crack of dawn (8 am is very early for retired people). Pam says the pilot must be a man because no woman would be so stupid enough to fly over houses at that time of day. It does make me wonder though what time the he has to get up to be over Villas Andrea at 8 in the morning. People tell me that the purpose of the plane is crop spraying for insects. If that is the case, why do we still have hundreds of flies and mosquitoes not to mention grasshoppers and other undesirables buzzing round the garden? The flies are the worst especially when they persist in landing on your face. So get the flies and the mossies Mr Yellow Plane otherwise buzz off round some other people’s houses. When we arrived less than two years ago and I started to turn over the soil in the garden I couldn’t believe what I was dealing with. At best the soil was heavy loam full of rocks at worst solid clay. My neighbour was so disgusted with his soil he went down to the local garden centre and bought soil to replace the rubbish that he had to deal with. In his opinion nothing would grow successfully in the soil we had been given so the only sensible course of action was to replace it. I told myself if the locals could grow produce in this soil then so could I. In England I would have rough dug the soil, limed it and let the winter frosts break it up. Without a winter frost that wasn’t going to work. So the best I could do was break it up by hoeing and raking and hope for the best. The soil is still poor in patches but is a lot better than it was. In any case the good thing about heavy soil is that it needs less watering and any fertilizer I apply doesn’t get leached away. There are still areas of solid clay where nothing will grow well but as you can see in less than two years the plants have done well. These two pictures were taken just about a year apart. Some plants have done too well and I now have to cut them back to stop them smothering the rest of the garden. The most gratifying plants are the ones that looked as though they were dead or dying like the cycad and he phoenix palm which both have new leaves in abundance. Even the hibiscus which looked as though it was just a bunch of twigs at the start of the year has flowered for months. Peter Kay tells the story of holiday makers taking the sunshine back in their cases to the UK. Is it possible that you can take the weather with you? Certainly when our visitors came this year the weather here changed from brilliant sunshine to a mixture of overcast days with some sunshine. Once they returned to England the weather changed back and we had brilliant sunshine again. Had they made a big mistake and brought their English weather with them? The day that John and Joyce left the skies were blue and the sun shone from early morning to dusk. It was much the same every day for at least the following week. Whilst they were here we had half days of clear skies at best. If it was clear in the morning it had clouded over by the afternoon and vice versa. It might have suited them but it didn’t best please us. It was the same for the girls in June. We even had a few dullish days when the Hugh, Angela and Andrew came in August. For next year please leave your English weather back home. Don’t bother packing it in your suitcases to bring here. We don’t mind you sharing our Spanish sunshine just as long as you don’t try and take it back to England with you and leave us with English gloom. Whilst we didn’t know the outcome of Pam’s mother’s stroke, the visit of our John and Joyce was in the balance. As it happened Pam had been back nearly a week before they were due to arrive so they were able to come. We were glad because they are long standing friends. Pam has known John for 45 years and I’ve known him for 38. We’ve known Joyce for over 18 years. Last year their flight was cancelled and they ended up arriving 12 hours late at 2:30 in the morning. This year they arrived on time in brilliant sunshine. The excellent weather didn’t last though and so we had a few days when it was cloudy at least for part of the day. It didn’t seem to spoil their time here though. We lazed around the pool, ate, drank and chatted. Generally it was just a relaxed week with a few visits to break up the pace. As you might expect, they left in brilliant sunshine. Why “six rashers”? Well John likes a bacon buttie for breakfast and is quite happy to make his own. Normally he would have a few rashers perhaps with an egg to make it more interesting. On the Sunday though there were six rashers left in the packet so he decided to cook them all rather than leave some. In fairness we are not talking Danish back bacon slices but even with Spanish bacon, a six rasher buttie is serious business! Why “four balls”? Joyce was tempted to go for a late night swim the first night they were here but then changed her mind. The deal on subsequent nights was that if four of the floating pool lights came on she would go for a swim. On the last night four of the lights came on but Joyce baulked on the deal. Perhaps on a future visit she might be tempted again! Thank you for your company. We hope you enjoyed yourselves. We also hope that you have a fabulous time cruising through the Panama Canal. It won’t be the same as a week in Bigastro but we’re sure it will be OK. I have to eat my own words. Pam’s father’s hoarding has paid off. When Jemma and Laura looked through the old clothes that Marjorie kept they saw a potential to make money. Apparently there are shops and web sites that specialise in clothes from the seventies and earlier. I didn’t know that. Jemma and Laura carefully went through the wardrobes at Arthur’s house and selected those items which they thought would sell easily. Jemma photographed them and sent the pictures by email to the owner of one of the web sites she had found. Her reward was a cheque for £300 plus postage for clothes that we would have either taken to the charity shop or more to the point the skip. I dare say there are even more items that are saleable especially the crockery and glasses which in some cases date back to the 20s. I ask you though, who would have thought that crimplene would come back into fashion? The pipework to carry the telephone cable is laid. I’ve seen it with my own eyes. I even asked the foreman who was supervising the job if the pipe was for telephones. It runs to the first Telefonica box at the bottom of the estate. From there the pipework goes round the whole estate. 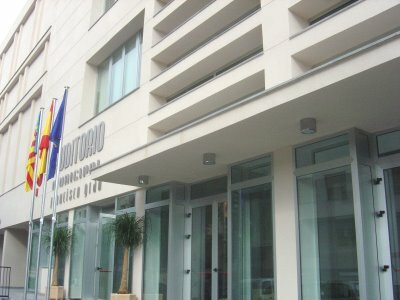 Each house is connected to the boxes and the phonepoints are already installed in the lounges and main bedrooms. If you lift the covers on the Telefonica boxes in the road you can see the cables. They have now put the cable in at the bottom of the road. A friend of ours saw them do it and again confirmed it was for telephones. Still people are not convinced. First there was a rumour that only the builder was to get a phone. The rumour goes on to say that a vote was taken at the Council meeting which proved 9 to 1 against phones being connected to Villas Andrea. Now why on earth would anyone go the trouble of laying 500metres or more of pipework just to connect one house? More to the point what would anyone in the council gain by denying us our phones? Of course it is election time next year. Could this be an early smear campaign to discredit one of the candidates? Still the rumours persist. We can only have radio phones at Villas Andrea. That is because two people have just been offered radio phones by Telefonica. One resident already has a radio phone. He didn’t need a cable to be laid up from the village to get it. Then we are told the cable that they have laid isn’t thick enough to supply a line for each house. Oh and yes, there aren’t the green boxes that you find in England where all the connections are housed. 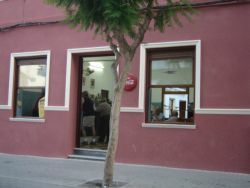 Yes there are boxes – we have one just around the corner on Calle Le Vigan which says Telefonica on it. I dare say there are others if you go round and look for them. I’d guess that there are more experts on telecommunications living here at Villas Andrea than there are in the rest of Spain. Anyway it appears that we should have phones by Christmas. All we need to do is to register our interest at the Town Hall and they will process he requests to Telefonica. My father always said “don’t speak too soon” and I certainly did when I said that we would probably keep the connection from Wi-Surf because it had become reliable. Our Internet connection went over a month ago. At first we were told that it was a satellite connection failure following a thunderstorm and that the provider was working day and night to fix it. Then we were told the provider had gone bankrupt and a new provider would need to be contacted: estimated time for reconnection 14 – 28 days. This was like déjà vu because the last time we had a long period of disconnection the provider had gone bust and had been taken over by the present company. Anyway we were then told that we would be reconnected within 7 days (sic) by ADSL rather than by satellite. Now that was good news because an ADSL connection should be more reliable. An ADSL connection would also make the phone useable. The question was then, how were they going to provide us with an ADSL connection? Obviously we would still use the existing wireless setup to connect to the Wi-Surf server up at the Pedrera but how were Wi-Surf going to connect the wireless setup to ADSL without a cable? There is no cable up to the Pedrera and it doesn’t look as if there will be in the near future. Apparently their plan was to use a hybrid system that would relay an ADSL connection from a site where there was a cable via microwaves to our site at the Pedrera. The hybrid system, although not as good as true ADSL, would make the phone useable. It seems that for the moment that will not be possible so Wi-Surf have had to resort back to a satellite connection with a different provider.Since VOIP is useless over a satellite connection, we will definitely move over to Telefonica for the phone as soon as we can. We will keep the Wi-Surf connection for the Internet though for two reasons. Internet providers in Spain work with much higher contention ratios than Wi-Surf i.e more users share the connection speed. Although Bigastro has an ADSL enabled exchange we don’t know where that is. If the exchange is too far away then our potential speed will be limited. I’d like to see what other people’s experiences are like before making the decision to move from Wi-Surf. The Town Hall has now collated the names and mobile numbers of all the people at Villas Andrea who want a phone. These will be passed on to Telefonica who should contact us to let us know when that will be possible. Since all the cables are now laid we are told that could be before Christmas. 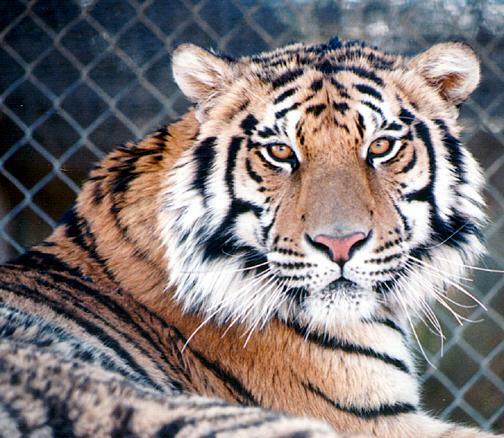 Pam is due to have one of her regular checkups at the hospital this month. So she will be back in the UK from 18th to the 31st of October. She will be spending some time with Laura in Sale and then moving on to Wolverhampton where she will stay with Jemma. Meantime I will be "home alone" again making sure the fence stays up and the plants don´t die. As you have already guessed or found out our Internet connection has been down for nearly four weeks. First we were told that the satellite provider had a problem following a thunderstorm. Then the provider had gone bankrupt. No problem though because we were to be connected via ADSL within seven days. Since then though they have had a problem with the antenna and have a replacement ordered. So we are waiting for the replacement to be installed. The good news is that it looks like the phone lines are installed and just waiting for connection. Either way I have a stack of messages stored on my computer ready to upload for you to read.